All’s not well in the land of bonhomie and bhangra. At lifestyle brand 1469’s annual exhibition, “Mela Phulkari VI”, the theme, Jaago Panjab, goes out as a clarion call. 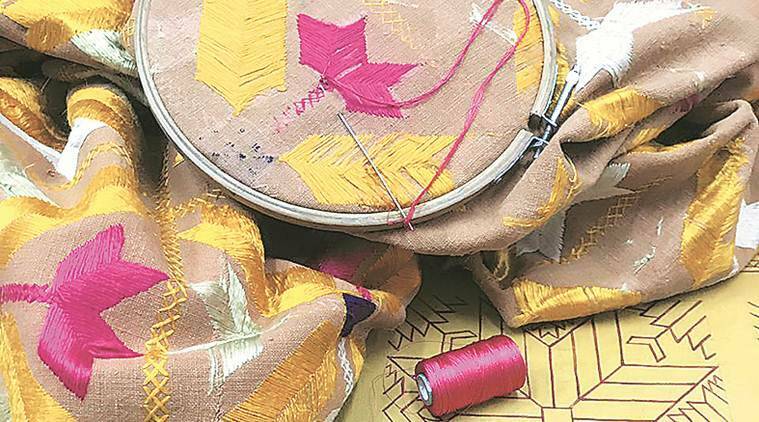 Opposite the entrance, the wall is occupied by an installation, titled Jaago, in which a ghara is filled with bits of metal, wood, fabric and strips of phulkari to symbolises the dying industries and handicrafts. “The green revolution that happened 40 years ago cannot be a survival point for the Punjabis forever. The soil has been over fertilised and, as a result, has lost its fertility. We have to work on the infrastructure and industry of this state that has been neglected over the years. The real celebration will happen when there is industrial growth in Punjab,” says Harinder Singh, who has created the piece with Amrita Kaur. A number of paintings dedicated to Guru Nanak — whose 550th birth anniversary the exhibition is marking — amplifies the theme. Pavan Guru Pani Pita / Mata Dharat Mahar (Air is guru, water is father, earth is mother) reads a quote from the Guru on a large, stamp-shaped work at the entrance. “Guru Nanak was an environmentalist. The message that he gave five centuries ago holds true today. Water conservation is the need of the hour. We also want to remind everyone how Guru Nanak was instrumental in awakening the people socially, religiously and ethically,” says Singh. The series on Guru Nanak also features rare works by MF Hussain and Arpana Caur from private collections. “This is the rockstar of Punjab,” said Singh to filmmaker Imtiaz Ali, who dropped by on Sunday, pointing to the central installation called Making of Panjab. The base of the piece is a part of toka or a machine used to cut fodder, and an essential part of the farming culture. The three machine tools on top of the toka are an indication that Punjab can’t survive only on agriculture. A glimmer in a dark landscape is offered by a diptych in which a squalid grey neighbourhood and a field overloaded in greenery is brightened by a vibrant piece of cloth being embroidered in shades of sunrise by women. “It narrates the untold strength of the women of Sangrur, who find peace in creating baghs even during tough times,” says Singh.